While a large number of reports claim Ferrari extracts more power than Mercedes from their Power Unit, reality proved things to be very different in Monza. In 2017, Ferrari showed solid improvement with their Power Unit (PU) from 2016 and this continued throughout 2018. However, Mercedes was in front since 2014 and they kept improving just as much. 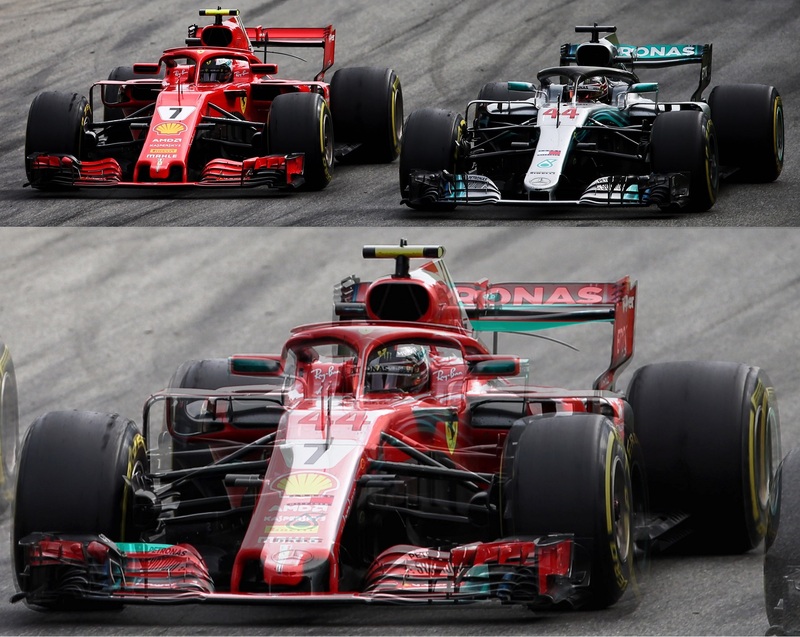 At the beginning of this season, Mercedes claimed power equality between them and Ferrari, only to claim Ferrari surpassed them a few races later. This was almost instantly and universally accepted by general F1 audience, media and other teams. In late 2017, Mercedes announced their PU surpassed the magical mark of 1,000HP, while Ferrari did so a few months later. It was reported that peak power difference between these two Power Units was 15-20HP in 2017, which would have very likely been the smallest difference since 2014. The fact Mercedes was first to reach 1,000 HP suggested to us that this difference remains. Since early in the season, controversy surrounded the Ferrari PU, leading to a FIA investigation which lasted a few races. The investigation included special FIA equipment aboard Ferrari powered cars, which acquired additional data for FIA to asses if any breach in Technical Regulations has occurred. Controversy was sparked by Mercedes enquiry into Ferrari PU (which is why the FIA investigated the red team) and their regular claims of sudden bursts of power from Ferrari-powered cars. That Ferrari was under the spotlight was a big difference from previous years. Especially concerning the PU advantage Mercedes held since current the start of V6 Turbo Hybrid era. Many tracks can be described as power-hungry, but none is more so than the famous Monza circuit, which hosted the Italian Grand Prix this weekend. 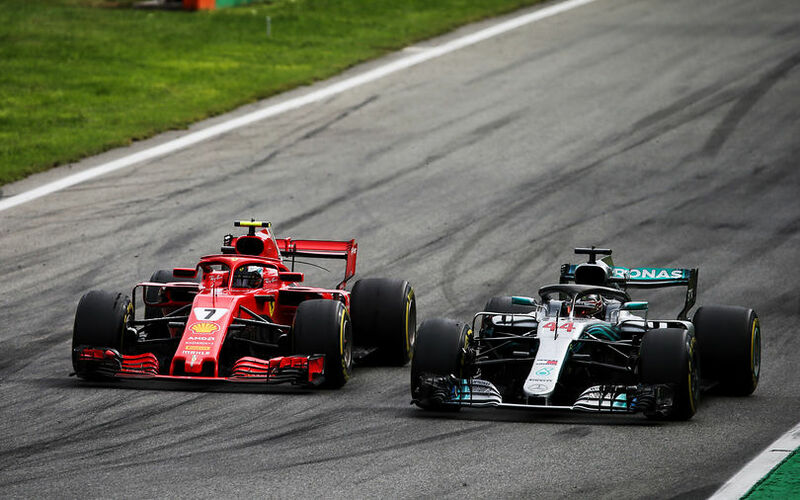 The defeat of Mercedes in Spa lead to a number of claims that Ferrari will have it an easy time in Italy, only strengthening the claim of Ferrari power supremacy. Ultimately, we asked ourselves – is this truly the case? Monza is famous for the lowest downforce and drag configuration of F1 cars in every season and 2018 was no exception. Our early analysis of Top 3 F1 cars in 2018 pointed to a number of areas Ferrari improved to lower their car’s aerodynamic drag, whilst increasing overall downforce levels. Add their alleged power supremacy into the mix, and the Italian GP was expected as a walk in the park for Ferrari. Things have unravelled very differently, though. Since Thursday, early pictures of the cars in the paddock revealed a difference in rear wing levels between Ferrari and Mercedes. As Friday in Monza was mostly a wash-out, a truly relevant comparison between the two cars could only be made be onwards from Saturday. The difference in wing levels was evident, as can be seen on Figure 1. Mercedes car featured a relatively large “scoop” rear wing design compared to Ferrari’s simplistic flat rear wing. The advantage of such scoop design is a reduction of induced drag from rear wing tip vortices, while maintaining a larger angle of attack in the middle. This design is generally used on cars that have enough power to overcome the increased pressure drag (compared to low angle of attack and flat wing design). The difference in front wing design of these cars is a trait of Ferrari since last year, as red cars usually feature a drop in the middle of their wings, highlighted in green on Figure 1. Both these features suggested Ferrari went for a lower drag configuration than Mercedes and it was expected to see them quite a bit ahead in the speed traps. 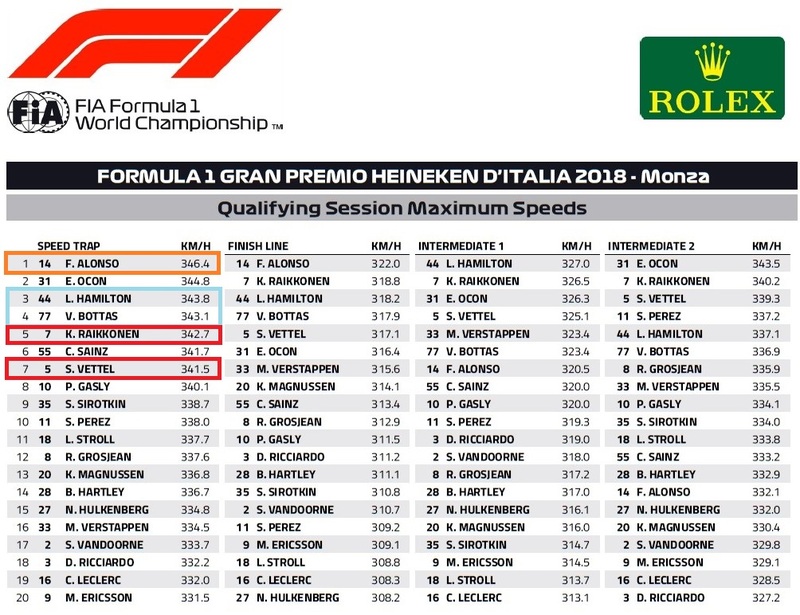 On Figure 2 we can see Mercedes was, in fact, just slightly ahead of Ferrari in the speed traps, while crossing Intermediate lines showed some small changes. Overall, this showed there was little to choose from between these cars in terms of top speed. Lap times showed this was in fact the case in corners as well, as red and silver cars exchanged fastest sectors regularly in Q3. Speed trap data from the race is skewed by DRS combined with tow from the car in front, which is why it shouldn’t be taken into account. Highlighted on Figure 3 is the difference in height of the scoop on Mercedes wing, along with the difference of front wing height in the middle. Aerodynamic drag is a function of dynamic pressure, reference surface area and drag coefficient. This coefficient, on the other hand, is a function of car geometry. The reference surface area is directly proportionate to the overall aerodynamic force. For drag, frontal area is the most important aspect – which was significantly smaller on Ferrari in Sunday’s race. The drag coefficient of wings is mostly a function of angle of attack, wing chamber and wing chord. While camber is hard to asses with relative certainty, angle of attack is easier to evaluate. Due to the scoop, the average angle of attack on Mercedes' rear wing was larger than that of Ferrari's. This strongly suggests Mercedes rear wing had a bigger drag coefficient than Ferrari’s counterpart. On the other hand, Ferrari car has a raised rear ride height, which increases the overall car frontal area. However, Ferrari is also strikingly slimmer in the side pod area, has smaller (frontal) radiator intakes and features less vortex-inducing surfaces on the car compared to Mercedes. It is, therefore, safe to assume Ferrari had less drag than Mercedes at Monza. How can we analyse this and put some numbers forth? Aerodynamic drag is the largest load cars have to deal with before reaching top speed. Compared to drag at top speed, rolling resistance of tyres is negligible. Hybrid power units of modern F1 cars now reach peak power of over 1,000 HP, or roughly 750 kW. Electric power, delivered to MGU-K is limited by rules to 120kW at 95% theoretical efficiency. This means teams probably use a bit more than 120kW if they are over this 95% efficiency (and reports would suggest so). 6kW is roughly 8 HP and if the peak power difference stayed the same from last year (roughly 15-20HP), this would suggest Mercedes had around 2% more drag on their car. With such a big difference in wing levels, 2% is a very plausible difference in overall drag levels between Ferrari and Mercedes. Should we assume reports suggesting Ferrari's PU is stronger than Mercedes' are wrong? Not at all. As ever, wording is very important in F1, as teams do not wish to reveal any more information than is required when talking to the media. While Lewis Hamilton claimed multiple times Ferrari's PU is more powerful, the wording of Toto Wolff is far more subtle. According to him, Ferrari's PU is stronger. This can mean a number of things, including peak power. Our recent analysis showed that this is not the case. Deeper insight into Ferrari’s supremacy revealed they are using electric energy for a longer period than their opponents in the early acceleration phase – corner exits. This was highlighted by Lewis Hamilton post-race analysis in Spa, where he suggested Ferrari has better traction and acceleration coming out of corners, while their PU is also able to “pull” for longer than others and reach higher top speeds (it should be noted Ferrari had a lot less angle of attack on their wings in Belgium, similar to Italy). With fewer slow corners at Monza compared to Spa, he expected a better race in Italy – which was exactly how the Italian GP unravelled for him.